Since 2011, Reagan’s Supreme Muffler has been providing general mechanic and specialty exhaust services to motorists in Milan, TN and surrounding areas. We pride ourselves in always providing honest, professional work to keep you and your vehicle safe and sound on the road. Come to us for exhaust, tires, brakes, shocks, hitches, tune-ups, belts and hoses, oil changes and more! When your vehicle starts to sound like a racecar or the “check engine” light on your dash starts yelling at you, there are numerous muffler shops in Milan, TN that you could go to for service. 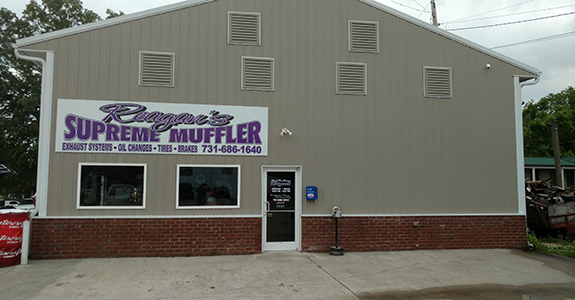 If you want personable service, talented technicians and a solution that specifically addresses the needs of your unique vehicle, however, the only destination for you is Reagan’s Supreme Muffler! As the local, leading experts on all things exhaust, muffler, brake and tire, we’re here to provide you with top-level services that keep your vehicle in peak functional condition. Whether it’s a simple fix—like outfitting you with a new muffler—or it’s a more invasive repair—such as replacing your oxygen sensor and catalytic converter—know that we’re ready to tackle the job. We’re pleased to be able to service just about any make, model or year! We’re a family-owned and –operated business! We carry a wide assortment of top quality tires in-house, for quick replacements. We stock a complete inventory of auto parts for your convenience. We’re pleased to offer military discounts to active duty service members.